WASHINGTON, DC — Because chronic inflammation is linked to increased risk for many cancers and other disorders, scientists have developed a tool to evaluate an individual’s diet for its potential to increase or decrease inflammation. In new research presented today at the American Institute for Cancer Research (AICR) Annual Research Conference, researchers presented results showing that diets high in fiber, spices, healthy fats and carotenoids all contribute to an anti-inflammatory effect that links to reduced risk of colorectal cancer. In addition to many cancers, chronic inflammation appears to play a key role in the development of metabolic syndrome and its related diseases. Today’s research builds on an inflammatory index of food and food components developed by University of South Carolina (USC) researchers. The dietary inflammatory index includes 45 foods, nutrients and phytochemicals. It was first developed five years ago using a global literature review of studies investigating the role of foods on one or more of six inflammatory markers, including C-reactive protein (CRP). At that time, the index based its inflammatory ranking on almost 1,000 studies. Last year researchers updated and strengthened the inflammatory index by including 1,943 studies published through December 2010. Saturated fat and trans fat rank among the top nutrients on the pro-inflammatory list; fiber, carotenoids, turmeric, ginger and flavonoids at the bottom. The recent study scored the inflammatory potential of 34,703 women’s diets who were part of the Iowa Women’s Health Study. Women were ages 55 to 69 and cancer free when they reported their dietary intake. By the end of 2010, 1,636 of the women were diagnosed with colorectal cancers, including 1,329 colon and 325 rectal cancers. Women who consumed the most pro-inflammatory diets were at 20 percent increased risk of colorectal cancer compared with women who consumed more anti-inflammatory diets, the study concluded. This was after researchers adjusted for key risk factors, including BMI, smoking and diabetes. 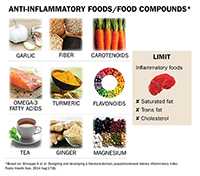 Green leafy vegetables, fish, fruit, nuts and whole grains were among the top foods more commonly consumed among the anti-inflammatory diet group. Food groups that were similar between the pro- and anti-inflammatory groups include refined grains, high-fat dairy, and chocolate. The study was published in Cancer Epidemiology Biomarkers and Prevention. “This confirms other work we have conducted on the inflammatory potential of the diet and what is known about how systemic inflammation plays a role in colorectal cancers,” says Steck. Another study published last month by the USC team found that a group of police officers eating the most pro-inflammatory diet were more likely to have risk factors associated with risk of heart disease and poor metabolic health compared to those consuming an anti-inflammatory diet. Currently, the team is developing the index as a tool for health professionals and then for consumers, says Steck. Dietary Inflammatory Index and Risk of Colorectal Cancer in the Iowa Women's Health Study. Shivappa N1, Prizment AE2, Blair CK3, Jacobs DR Jr3, Steck SE1, Hébert JR4. J Occup Environ Med. 2014 Sep;56(9):986-9. doi: 10.1097/JOM.0000000000000213. Association of a dietary inflammatory index with inflammatory indices and metabolic syndrome among police officers. Wirth MD1, Burch J, Shivappa N, Violanti JM, Burchfiel CM, Fekedulegn D, Andrew ME, Hartley TA, Miller DB, Mnatsakanova A, Charles LE, Steck SE, Hurley TG, Vena JE, Hébert JR.
Public Health Nutr. 2014 Aug;17(8):1689-96. doi: 10.1017/S1368980013002115. Epub 2013 Aug 14. Designing and developing a literature-derived, population-based dietary inflammatory index. Shivappa N1, Steck SE1, Hurley TG1, Hussey JR2, Hébert JR1.